Presenting the original Sop n Mop. It is more than WOW! Its Awe-Sham. You’ll never have to purchase a paper towel again. The Original Shammy Sop N Mop is an ultra absorbent miracle shammy cloth that is a must for camping, swimming, auto washing any sporting event and more. It raises any liquid from any surface. Sop N Mop are tough and durable, and holds 21 times its weight in liquid. It mops up spills fast and doesn’t scratch surfaces. Use it to dry pets or sweaters. 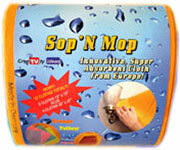 Sop N Mop’s are made to the highest quality in Germany. They are machine washable and bleachable as well. Sop N Mop will last you for years. Right now you can get a total of 12 pack of Sop N Mop for just $19.95 plus shipping and handling. It includes 8 small 15″ x 15″ clothes and 4 large 20″ x 27″ clothes.